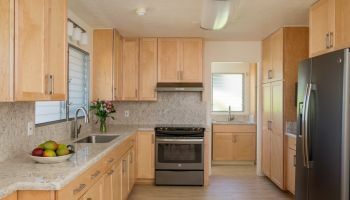 Looking to address some tricky areas within his new kitchen and home construction, one Oahu homeowner was referred by a trusted friend to Homeowners Design Center, a full-service company which helped him find solutions that are both highly functional and stylish. A new home construction that featured a mid-range cabinet line by Diamond, using different finishes in different rooms. One of the challenges the team faced for both the kitchen and gazebo areas, both adjacent to the pool area, was possible water damage being an undeniable factor to consider. “We actually built a platform (in the gazebo), and then set the cabinets on that in order to raise them above the floor level,” explains designer Jessica Omoto. The bold black granite used for the countertop of the gazebo cabinetry serves as a stark and stylish contrast and focal point that draws the eyes as well. The bathroom near the gazebo was also infused with some extra character, via the incorporation of a furniture-style sink, complete with countertop and feet. Cabinets in the gazebo set on a raised platform to prevent water damage. For the sink in the gazebo powder room, Homeowners Design Center created a furniture piece by removing the toe kick space and adding feet. Within the kitchen, also adjacent to the pool and prone to water-soaked foot traffic, the owner wanted flooring that looked like natural wood, yet could withstand the constant exposure to water. Homeowners Design Center found the perfect fit in their choice of natural wood-looking vinyl plank. As for the cabinets, “The homeowner was wanting something that was a little better than your contractor-allowed cabinetry,” explains Omoto, going with a mid-range Diamond line. A vinyl plank that has the look of natural wood was used in the kitchen and the adjoining rooms leading out to the pool area due to constant water exposure. 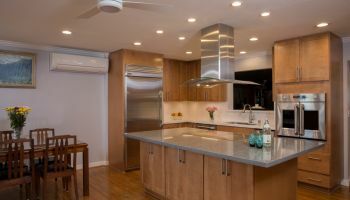 Choosing a lovely, classic cherry wood for the cabinets in the kitchen and throughout the house, Homeowners Design Center was then able to add a bit of variation in order to differentiate between each room by utilizing a different finish upon each. User-friendly and durable, yet still decorative, engineered quartz was chosen for the kitchen countertops, and a different color of the same Cambria brand for the gazebo bathroom. Also added were some of the popular features in cabinets today, which included soft closing doors and drawers, gorgeous KitchenAid appliances (including separate built-in oven and cooktops) and touch latches on the back side of the cabinets on the island. To watch the video and hear kitchen designer Jessica Omoto describe this new kitchen construction, just click on the image below. For more information about how Homeowners Design Center can help you with your new kitchen construction or remodel, just click on any photo.